CoconutMilk burfi Or Milk coconut burfi is a sweet dish made of coconut, milk and sugar. you can use fresh, frozen or dry coconut. Similarly you can use whole milk or condensed milk. Whichever ingredient you use, it tastes delicious. It is very easy to make. My Mother In Law used to make these barfi, CoconutMilk Burfi is one of the signature dish of Amma(My MIL). She makes it often at home. She use to say( MSC Burfi-Milk, Sugar, Coconut).Many variations can be done to this burfi. 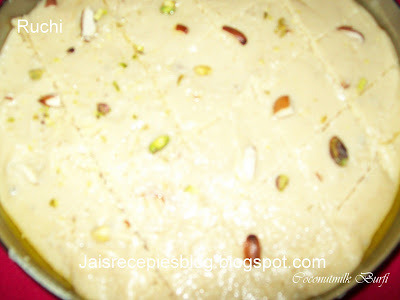 My whole family love this burfi. When I made these I follow her method. The photo was not as picturesque but taste is gorgeous. 10to 15-cashewnuts & few almonds. Soak kaju and badam for an hour. Grind kaju &badam with fresh grated coconut & 2cups of milk. Grease a flat tray, or plate with ghee and keep aside. Heat sugar, milk grinded coconut with remaining one cup milk to a boil in a medium saucepan over medium-low heat. Stir fry continuously, on medium heat, until the whole lump begins to come off the sides of the wok. Do not make it too stiff, otherwise burfi will not be soft and will taste like chewy toffee. When lumpy and sticky, add the ghee and cook until mixture becomes very thick and starts to leave the side of the pan, about 50 minutes. Make sure that the surface is even and the margins are straight. Once it is cooled, it keeps the shape because of the sugar syrup). Leave it for cooling for around 10mins. Then cut them into desired shape. Sprinkle pistachios, cardamoms and almonds. Press them gently into the surface. Slice into squares or diamond shapes. Any left-over corner pieces can be moulded into small balls or laddoos. Store in an airtight box. When you grate the coconut, grate only the white part. Don't grate the bottom brown part. This is to ensure the white color for burfi. Pulse the grated coconut for few seconds in mixie to get a fine texture. You can omit the nuts and cardamoms if you like. If you want to make Laddoos (balls), and not burfies (diamond squares), simply allow the soilds to cool a little until they are hand warm. Then shape 1 tablespoon at a time, into balls by rolling between palms and fingers of both hands. 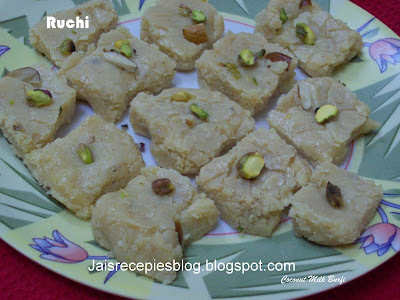 Wow Burfi looks mouthwatering. Thank you for the tips on grating coconut. Coconut burfis my alltime favourite, i love munching them whenever my mom prepare these burfi at home when i was kid..delicious.. Sounds so yummy!I love milk sweets and they just melt in the mouth!!! 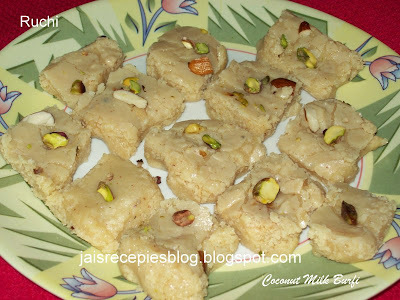 i love burfi soo much...anytime i can have it..
Coconut milk peda sounds new to me...you made it very interesting...Like the new layout, so kool. That is come out so well for you, nice blog you have ! !